The TO-DO list is huge at the moment as we get ready for Fort Bragg and Mendocino's summer visitors. But after spending a rainy Monday in the office, we had to get out and paddle. 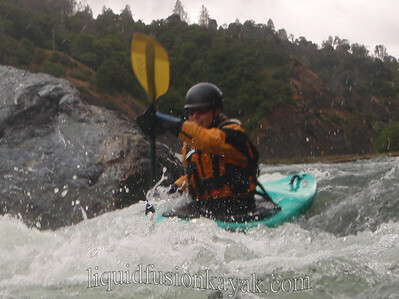 Of course an inch or more of rain in Mendocino County often means WHITEWATER!!! 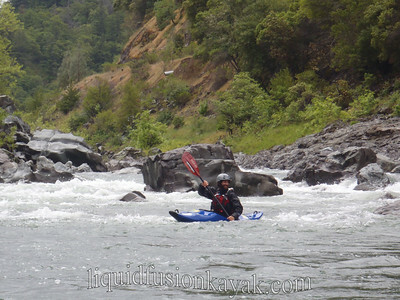 So we packed up our whitewater kayaks and headed to the Eel River for what would probably be our last run on the Eel until next winter. In winter in Mendocino County, the ground is usually very saturated with water. When we get a couple of inches of rain, a lot of it runs-off quickly into our local rivers. However, after having a couple of dry weeks in the spring, the vegetation and ground are thirsty and soak up spring rain showers. This results in less flow in the river than we would anticipate in the winter. When we got to the put-in, the water level was very low - just runnable. It was fun to see the river at this level. The flow was slow so there was plenty of time to make moves as long as you weren't trying to dig your paddle into rocks. There wasn't quite enough water in the eddies to get a good purchase with a paddle to use the eddy to feed onto a surf wave. The guys definitely tried resulting in lots of clunking sounds of paddles on rocks, but they were successful and caught a few good waves. I sat back and took photos and video of their antics as I enjoyed the greenery of spring and the intermittent showers. It was very exciting to see a wood duck with her brood of 11 ducklings (unfortunately I had technical issues with my camera and missed the shot). 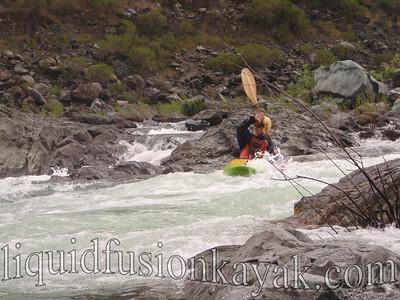 A couple of the rapids were really boney at low water and others were really fun. 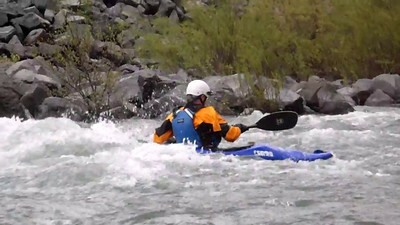 My favorite was the trailer rapid which at normal flows is fast and furious with a couple of nasty hydraulics to avoid. At low water, the characteristic jumble of split rocks at the bottom was visible but was otherwise a completely different rapid. Where the nasty hydraulics usually churn were giant eddies. Instead of taking the freeway line past these monsters, we could zig-zag and eddy-hop along as we negotiated the elevation drop. 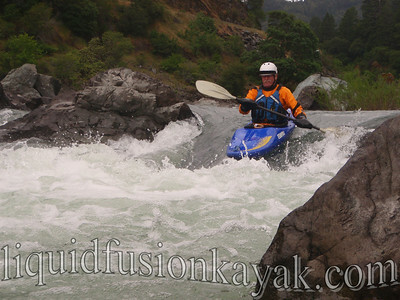 Maybe we will get another good spring rain for some more local whitewater boating, but if not we won't be kicking ourselves for missing the last run on the Eel of the year.